One of the most prominent landmarks of Chennai is of course – Central Railway Station – the road next runs parallel to railway tracks and borders George Town on the West. The road was named after the wall built as a protective measure by the British in 1772–1773, which still remains partially. The attacks by Hyder Ali in 1767 catalysed the process, which resulted in the building of a protective wall around the new Black Town. The wall originally ran from Cochrane Canal (Buckingham Canal) to the junction of Poonamalle High Road ………. I had proudly posted about the great person who launched two vessels much against the British Imperialists with the support of Tilakar. In Nov 1906, steamships ‘S.S.Gaelia’ and ‘S.S.Lawoe’, were launched which can perhaps be looked as the foundation of shipping industry of the Nation. Till it was challenged thus shipping was a monopoly enjoyed by the British India Steam Navigation Company. The wily British reportedly slashed the fare per trip to Re.1 (16 annas) per head. Later the British company went further by offering a free trip to the passengers plus a free umbrella, which had ‘S.S.Gaelia’ and ‘S.S.Lawoe’ running nearly empty. The restrictive trade practices coupled by the political actions taken against the pioneer and other freedom fighters pushed the company towards bankruptcy is the sad history. 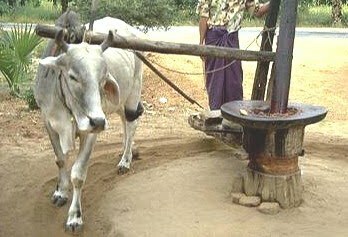 One of the primitive implements for extracting oil is bullock powered oil press (Chekku in Tamil). It is no engineering marvel – the power required to move, rotate and crush the ingredients was supplied by oxen. To ever imagine replacing the animal with a man would send chill on the nerves. But for the cruel British Govt, that was one way of punishing the young and brave who dared to openly challenge them. The man who underwent all pains for the Nation is the great patriot – ‘Vandanam Olaganathan Chidambaram Pillai’ (VOC) (fondly Kappalottiya Thamizhan) born on 5th Sept 1872. His father was the eminent lawyer Ulaganathan Pillai in Ottapidaram, Tuticorin Dist. Like his father, he also became an advocate and often pleaded for the poor. He was attracted by the Swadeshi movement by tne Bal Lal Pal, a time when Gandhi was not at the National scene. Against the Imperial policies of British, he fought alongside the likes of Subramanya Siva, Subrahmanya Bharathi, Aurobindo Ghosh. VOC also presided the Salem Congress Session. After that speech in 1908, he was arrested on charges of sedition. Mahakavi Bharathiyar and Subramanya Siva appeared in the Court in the case and VOC was sentenced to double life imprisonment tantamount to 40 years ad confined to prison. He was treated badly as a convict and subjected to inhuman torture. History has it that he was yoked in place of bull in the oil press and made to work cruelly. He was later released in Dec 1912. July 7, 1908 is a date no patriotic Indian of Tamil origin could afford not to know for it is on that day Madurai-born freedom fighter Subramania Siva became the first patriot in the whole of Madras Presidency (encompassing much of present day southern India) to be found guilty and imprisoned on the charge of sedition in British India. Coincidentally, it was in July 1996 that his birthplace Batlagundu (Vathalagundu in Tamil) was taken away from Madurai district after the latter’s bifurcation to form Theni district. Therefore, it is only apt to recall this July, the history created 106 years ago by Arthur F. Pinhey, the then Additional Sessions Judge of Tinnevelly (now Tirunelveli) district. Though Siva was the prime accused in the case and his mentor V.O. Chidambaram, was only the second accused, the judge had surprisingly ordered a comparatively lighter sentence of 10 years of transportation on Siva and that of transportation for life on V.O.C. “For the conduct of the second accused I can see no extenuation. He is evidently disloyal to the core and a man of a type most dangerous to society,” Mr. Pinhey said. The judgement known as ‘King Emperor versus Subramania Siva and V.O. Chidambaram Pillai’ is a piece of history; though the conviction imposed on the two great freedom fighters were confirmed by the appellate courts of those days, the punishment was reduced considerably. PS 1 : Kappalottiya Thamizhan, a 1961 film – the story of VOC based on bio written by Ma. Po. Si. (M.P.Sivagnanam); directed by B. R. Panthulu, the film featured Sivaji Ganesan and Gemini Ganesan in the lead roles. The film reportedly failed at box office.